New drama serial Muqaddas (pure / sacred), written by Adeel Razzaq, stars Iqra Aziz, Zainab Qayum, Noor Hassan, Hina Bayat, Farhan Ali Agha, Nida Khan and Khalid Anum in lead roles. Directed by Ali Masud Saeed, Muqaddas is an out-of-the-ordinary serial with an intertwining of twists, turns and shady secrets. The drama starts off as a love story between young, pretty and confident Muqaddas and the town’s most eligible bachelor Athir, whose biggest desire in life is to marry the girl of his dreams. In a shocking twist, Muqaddas gets kidnapped from Athir’s home on their wedding night. The serial then centers around the repercussions and impact of her abduction on both families, and most of all, on Muqaddas when she does finally return home. The storyline is intense; the mysterious and strange interaction and involvement of key characters in almost every episode keeps audiences glued to their screens. Best of all, Muqaddas airs 3 days in a row so you don’t have to wait for an entire week for the next episode. The fresh and vibrant starcast puts on wonderful performances. The OST of the Serial Dil Maachis Hai has gained immense popularity and is sung superbly by Shuja Haider. Rabab Hashim and Ahsan Khan are paired with each other for the very first time in director Ahmed Bhatti’s new drama serial Mere Dard Ki Tujhe Kiya Khabar (MDTKK) in lead roles. The drama holds a big star cast including Rubina Ashraf, Farah Shah, Hasan Ahmed, Shamim Hilali, Mizna Waqas, Ahmed Zaib, Hasan Niazi and Gul-e-Rana. Written by Rukhsana Nigar in a rather unusual, and filmy style, it tells the story of how one instance of confusion turns the life of smart and beautiful Zara into one of embarrassment and disgrace brought upon her by her very own family. It takes them no longer than a second to turn her into a perpetrator, and not listen to her defense. Rubina Ashraf plays the villain in this serial, and unfortunately, does an awful job of it. Being as multi-talented as she is, her fake and spurious portrayal is a disappointment. 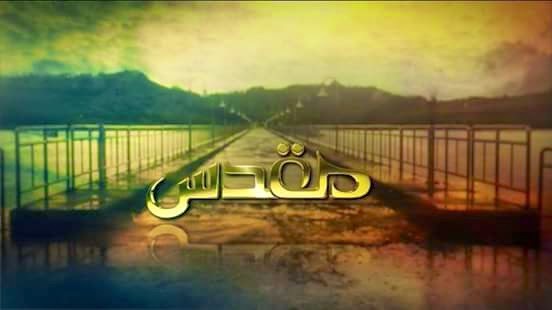 The serial is unique in its plot, and yet features most ingredients of a typical drama serial. Ahsan Khan is at his best in MDTKK, whereas Rabab needs to now get out of her comfort zone and take on more challenging roles. The serial keeps you wondering about what will happen next. You will not be bored even for a minute. Maybe not a must-watch, but a good way to spend a Saturday night without getting out of home. Madawa is the story of a young girl from a poor family who, after her mother’s remarriage, is raised by her grandmother. Unlucky Ayman goes from looking forward to a new father’s love, to losing even that of her own mother. The serial seems somewhat unreal – a mother agreeing to abandon her own child for a better life for herself, raising someone else’s daughter instead – seems too selfish. What will happen to Ayman after the death of her grandmother; where will she go? Can she count on her mother to take responsibility for her now, and welcome her into her new home and family? Or will Ayman continue to live the life of an orphan? 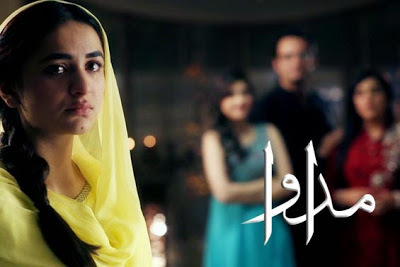 Madawa has a unique storyline, a brilliant performance by Yumna Zaidi and a stellar star cast of Yusra, Hina Altaf, Shehzad Sheikh, Nauman Masood, Samina Ahmad, Zara Tareen, Seema Sehar, Imran Ashraf, Asad Siddiqui, Sajid Shah, Adil Murad, Behroze Sabzwari – and yet, none of these is able to save the drama. Madawa is an average, typical, depressing serial which has nothing fresh to offer. Give it a miss. Drama serial Shukrana is a new serial from Mastermind Productions. Directed by Kashif Jaffery and produced by Hassan Zia, Shukrana is based on innocent and childlike Shukrana (Sanam Chaudhry) who is her father’s sweetheart and the youngest in her house. She is the perfect little girl – obedient, hardworking, intelligent – every parent’s dream. Along with such perfection come responsibilities, rules and regulations – all of which she has to follow, as nothing less is expected of her. Shukrana’s dream is to become a doctor and serve her country, but her conservative mother is afraid of her naïve daughter falling prey to cruel society. The only way she permits Shukrana’s further study is on condition of her engagement to her fanatical, obsessive and cynical cousin. Writer Mansur Mushtaq has tried to highlight the issue of pressure on middle-class women, not just by society, but by family and parents, who often end up limiting their daughters in their over-protectiveness. Will Shukrana, like always, obey her parents’ wishes and choose a lifetime of unhappiness, or will she stand up for her rights and follow her heart, making her own career and life decisions? 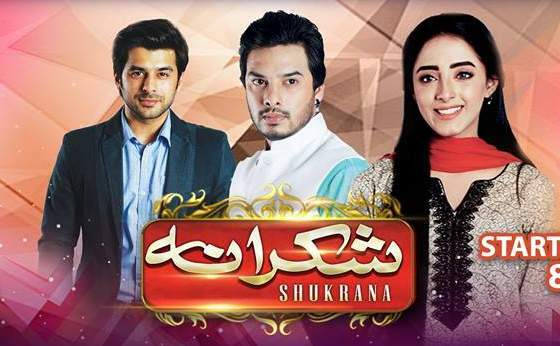 Shukrana is a light-hearted and relatable serial starring Sanam Chaudhry, Humayun Ashraf, Kunwar Arsalan, Nayyer Ejaz, Humaira Ali and Tariq Jameel. It is an appealing and absorbing watch on Friday evenings.